Re: YANTRA BAMBOO TATTOO UDON? YEP thats what i want.. In fact the finger is pointing to a tiger thats what i want..
mrbeerlao wrote: YEP thats what i want.. In fact the finger is pointing to a tiger thats what i want.. Yes, i understand,its my finger pointing to the tiger and its my wifes sistersoon who wheres it. maybe i can connect U whit this men but i am going for a small vaccationtrip tomorrow and come back next saturday.....you can PM me, Okej.......have a god day! that's a quality tattoo. i have a few tattoos but i'm not sure if i fancy the bamboo style, i sat and watched a woman get one done on her leg inpattaya and didn't like the look of it. 3) there is a lot of stuff that goes on when getting the tattoo from the MONK, there are rules to follow and offerings to be made at the temple. There are also rules to follow after you get the sacred tattoos. polehawk wrote: Try Phon Tattoo Bar in Nutty Park. He advertises "free design" work so maybe if you had a picture of the Yantra Bamboo one for him to work from?. Yantra Bamboo Tattooing is a method using a bamboo stick with a sharp point, dipped in ink and then into your skin. I saw a bloke getting one done in Pattaya. Beware of infections. As O/T said Beware of infections. My Niece who is only 18 has nearly died in hospital from contracting Hepatitis A & B and is still in serious condition in hospital. She apparently got a small tattoo on her back from a Wat / Temple in Nong Wua Sor a short time ago. She is now not critical but has 1 -5 years to live dependent on how she follows doctors instructions. Temple tattoo people do not use sterilized equipment as far as I know but I could be wrong there. Been re-reading thread title and it refers to bamboo which is obviously a disposable resource and a new portion of bamboo applied for next job (Hopefully). I still think that the warning is applicable though. is somebody able to explain where is Wat Loong Yang exactly ? behind the military golf course before nong bua lamphu...........you need to go with a Thai person and have all the offerings ready, the rules to follow will be translated by your Thai friend, its a very complicated ritual. At this GPS-location 17°23'00.4"N 102°45'29.7"E there is a very popular Bamboo Tattoo Monk/artist. 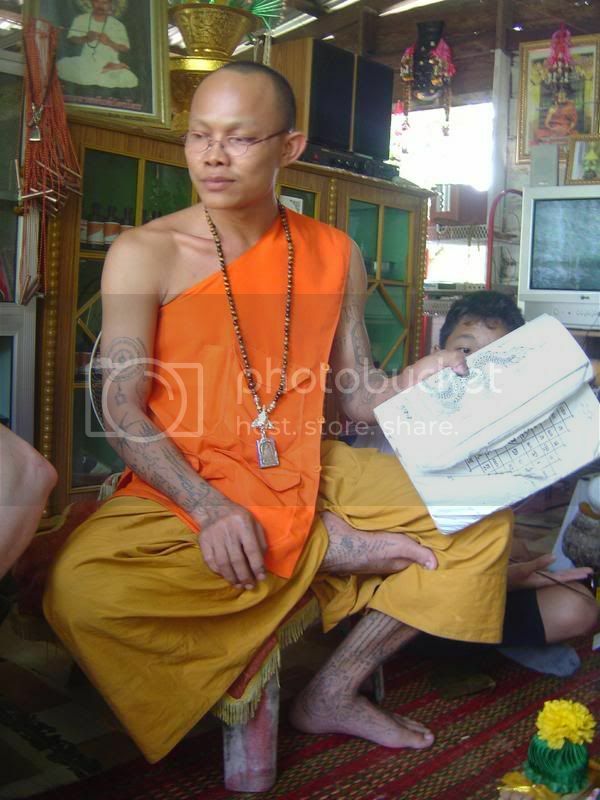 I am not sure if he is a monk but he has built himself a sort of temple where he tattoos so many locals. He likes to receive some small gift like flowers or a pack of cigarettes and there is always some praying going on before the work is done. Price will be "up to you" and I have seen the locals pays just a few hundred for a guite large tattoo. I took the coordinates from Google maps but there was no Street view so I am a little uncertain but if I remember correctly you will cross the little bridge and go left and then it is the first road to right and almost to the end. There is a small house with a little shop to your left and the "temple" will be at the back of the garden. Hey thanks for the pin drop! That's literally 15 minutes from my house lol. Would you be willing to get a screen shot on Google Maps and post it here in the forum? Im having a hard time finding exactly where you are talking about with your pin drop, North East South or West of Coordinates you provided? Sorry, I cannot give a better description. It is now a couple of years since I was there and I tried to pinpoint the place out of my memory. I suggest you try try to ask people in this area, this guy should be wellknown on his neigborhood. If it is not the first Si down to the right it could be the second or third. Lassbasse, i found Arjan Kahi, thank you very much. My wife and I drove around and asked for him, only took 3 attempts. It's ironic, the Arjan you were speaking about is actually the same man from the picture posted here 7 years ago! He was happy to see that picture and asked for it lol.